Proper site preparation is essential for any construction project. 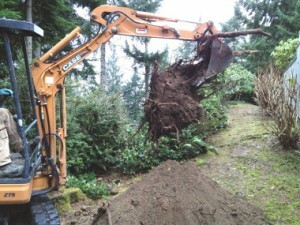 The process includes basic land clearing, removal of duff, leveling and grading, trenching for utilities, and excavating for sewer, septic, footings, and foundations. This involves the removal of trees, roots, and other vegetation from the building site. You also need to consider what to do with the debris. While it can be hauled away you may want to locate areas on your property that need fill, and you can form slash piles to burn vegetation. If you do, burn permits are required at certain times during the year and all proper safety precautions need to be followed. Of course logs can be cut for firewood. 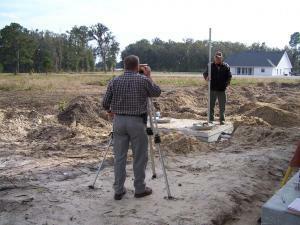 Almost any foundation will require some excavation. You again want to plan ahead to take advantage of the excess dirt which can be used for many purposes on your property. We can also do any necessary trenching for utility lines,and save time and cost by adding the septic system during the site prep phase or connecting sewer lines if that is available on your property. Normally there is naturally occurring duff to be removed before grading of the soil can happen. Soil can be positioned to create berms for diverting snow melt, and to improve drainage on the building site. We also can control the cut and fill with the dug up soil so haulaway will be kept to a minimum, and the best compaction will occur for a solid foundation. If you have good topsoil you will want to save that for when construction is completed to be used with the final grading for landscaping purposes.